I SEE ASL/DEAF CULTURE EVERYWHERE! 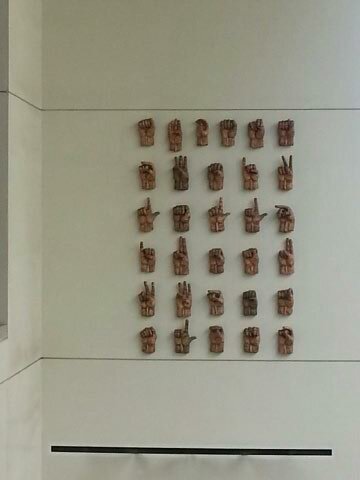 No matter where I go I always notice anything connected to ASL or to the deaf community or the lack there of. The good I notice is I attended the Career in Education Conference and stayed at the Residence Inn hotel and on my way to my meeting I noticed that one of the doors had this button and two signs next to it (picture on the right). I thought, my goodness is this for Deaf visitors where the lights flash inside the room to let the patron know someone is at the door. 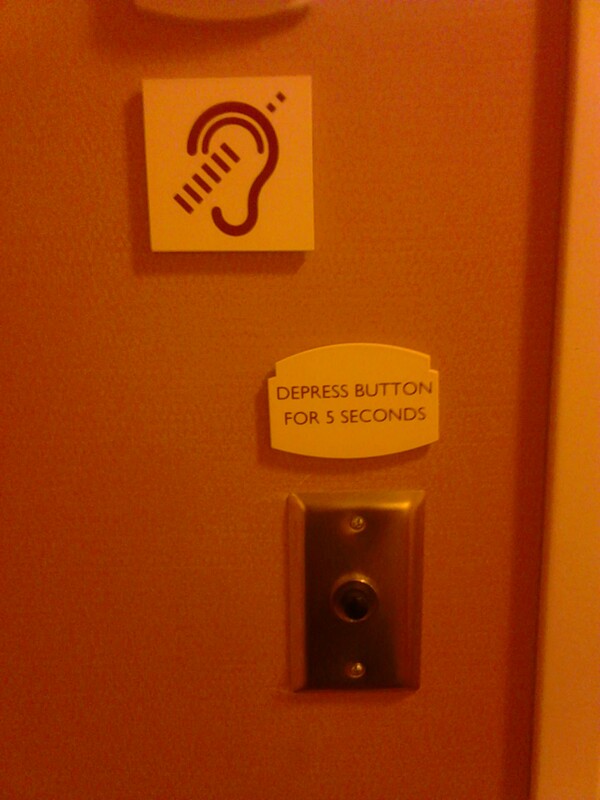 How awesome, that the hotel has deaf-friendly rooms. It is also good to know what the process is to finding out if hotels have this option for rooms and how staff routinely lets deaf patrons know this is available to them. More good, the first picture is HUGE 3-dimensional artwork with all the manual letters of the alphabet. The artwork is located at the Sacramento COnvention Center. I noticed it as I was going up the stairs and could see it from the second floor because it is sooo huge. I also enjoyed its presence as I went down the escalator. I had my friend go back up and stall the line for the escalator just so we could take a picture. The one thing I noticed that was missing from my Sacramento trip and directly connected to the Careers in Educator conference is I did not see any Deaf/Hard of Hearing educators or interpreters. The conference had over 2500 educators or people involved in education, it had wonderful keynote and guest speakers and I kept wondering who is interpreting this or are there deaf attendees in front of the conference. I looked and never saw any, I also asked but no-one knew. I think they should consider reaching out and connecting to underrepresented populations in education. I mentioned it and they suggested I complete the conference feedback survey and note this information. We will see what happens next year. If anyone attended this conference leave me feedback about how it was no matter if you are deaf, hoh or teach deaf children.